9 Then the king called Saul’s servant Ziba and said to him, “All that belonged to Saul and to all his house I have given to your master’s grandson. 10 You and your sons and your servants shall cultivate the land for him, and you shall bring in the produce so that your master’s grandson may have food; nevertheless Mephibosheth your master’s grandson shall eat at my table regularly.” Now Ziba had fifteen sons and twenty servants. 11 Then Ziba said to the king, “According to all that my lord the king commands his servant so your servant will do.” So Mephibosheth ate at David’s table as one of the king’s sons. 12 Mephibosheth had a young son whose name was Mica. And all who lived in the house of Ziba were servants to Mephibosheth. 13 So Mephibosheth lived in Jerusalem, for he ate at the king’s table regularly. Now he was lame in both feet. 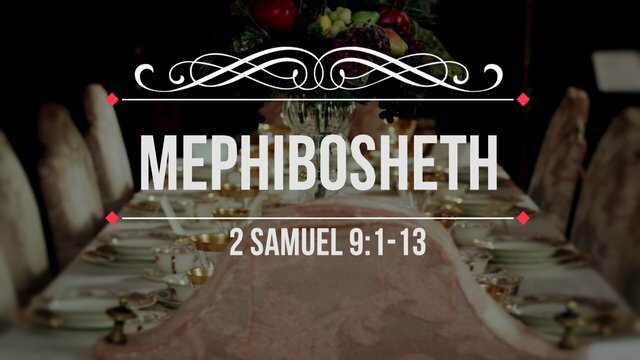 Yesterday during worship at church I was reminded by the Lord the story of Mephibosheth. How often I have felt like him. Crippled, helpless, subject to the care and needs of others(I’m not disabled). How he must have feared when Saul died because it was common for new kings to kill all direct descendants of the previous king. He ran, had to have help to run, from the new King David. Feared for his life in his crippled state. Defenseless. Broken. For too long I was like the old Mephibosheth. Crippled by shame and addiction. Fearing the previous king(the enemy). But the new King came looking. He came looking for me. He sought me. He found me crippled and lame with shame, hurt, addiction, and with a false view of Him. And He place me at His table! He prepared it for me! He cooked for me! He washed me feet…He washed my lameness away. He wiped and collected my tears. I became the new Mephibosheth. I place to eat at the King’s table forever. The King mephiboshethed me. Mephibosheth in Hebrew means exterminating the idol. He, my King, exterminated my idols. They fell to the King. He destroyed them. When I was feeling this overwhelming love pursuit. I wanted to get on the mic and share with the congregation but I am microphone shy or more like freaked out (I know I am called to speak). The overwhelming love of the Father. How He searches us out. The Hound of Heaven as He has been described as. WHO? WHO CAN I SHOW MERCY TO? That is who my God is! He searches for who He can show mercy to. Do you hear Him pleading? If not, then hear Him pleading through me…come out and let Him show you mercy! He wants you! He loves you with an everlasting love. He is not worried about your crippling or wounding or shame or even your anger with Him. He is looking for you and begging be reconciled! He loves you and He sees you….and He is running after to meet you in your mess with a robe and ring….with a huge feast prepared! YUM!!!! Have your fill!!!! ← Elijah House Training completed! Thank you for following my blog. May the peace, grace, love and protection of God be upon you and yours in the name of Jesus Christ. Wow! I love this! I have actually been studying this story as well! Another beautiful truth about it, is that David’s desire to show kindness to him goes back to the covenant that David made with his father, Jonathan. David made a covenant with Jonathan to show him lovingkindness to him and to his decedents after him – a great illustration of our Covenant keeping God!! Amen! This ministered me. Thank you. I encourage you to speak, don’t be afraid.